@norim PPK requires you to log the raw GPS data while you are flying (and doesn’t require an RTK base at all). GPS_RAW_DATA 1 should log this for you. You then have to extract the data from the dataflash log (MP used to be able to do this, I haven’t tried it in several years). 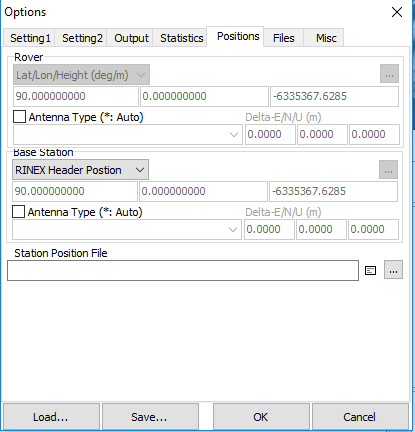 Once you’ve extracted the RINEX data you need to run it through a GPS processing suite (there are a number of commercial suites for this, RTKLib is free and should be capable of doing it, however I’ve personally found it to be a hassle to get anything useful out of it). To do this you will also need log data from a reference station with a known position. You may have a free one close enough that you can use, otherwise you will have to also acquire this set of RINEX files yourself) Once you have a corrected GPS solution you need to tag your photos against this output file (match up timestamps on camera feedback, and interpolate the GPS data for the best position match). You can choose to do vehicle offset corrections at this time as well, or you can leave that to the photogrammetry suite if you are feeding one. I’m not aware of any published scripts or programs that will do this last step for you, you will either have to manually do it (which given the number of photos in mapping sounds terrible), or find someone interested in implementing a solution. There are softwares out there that do the vehicle offset corrections, etc. That’s how most of the multi-million dollar manned aircraft sensors operate. Everything is done in post with GPS-IMU logging systems. I think it would be really neat to re-insert the PPK corrected GPS messages back into an EKF to have a highly accurate position-orientation model of the aircraft. Then that could be used for geotagging with orientation as well as position. The more accurate the camera’s position is, the less overlap is needed for accurate 3D reconstruction. That’s part of the reason why large aircraft often fly at only 20% sidelap. Hope U found a solution to your problem. so my question is : How did U made the .obs file using mission planner ? 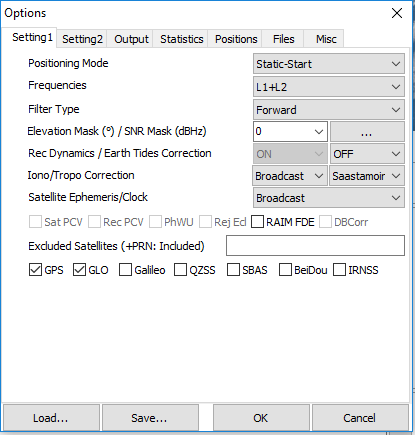 How did U convert the kml (or gpx) file to a obs one ! 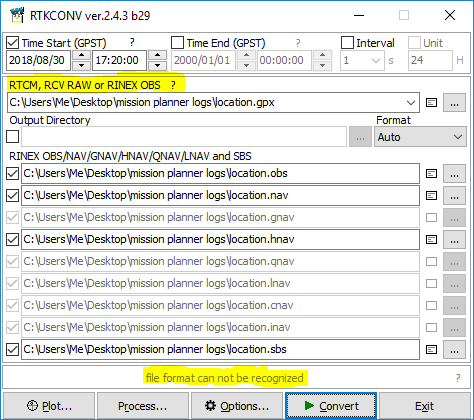 i think because the input should be a RTCM, RCV RAW or RINEX OBS file. Use that file, not the gpx or kml.